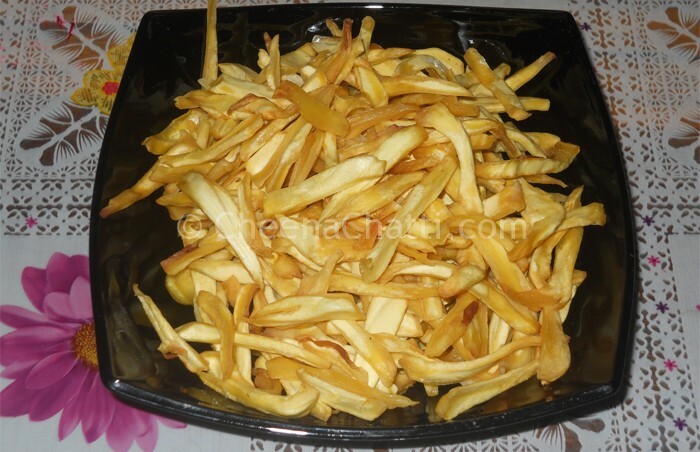 Chakka Varuthathu / Deep fried jack fruit chips is a very popular Kerala snack / Nadan Palaharam prepared by deep frying from the Chakka Chulas (the edible yellow part of jackfruit). Since jack fruit trees are available in the yards of all most all Kerala homes, this snack is very popular in Kerala. Besides that you can store this chips in airtight containers for long time also. Peel and remove the white strips from the Chakka Chulas. Remove the seeds from each jackfruits and divide the soft flesh part into two halves. Cut each of these halves into strips of medium thickness. Mix turmeric powder and keep aside for 5-10 minutes. Heat the coconut oil in large thick bottomed pan, when the oil is hot lower the flame and drop in a handful of the sliced jackfruit strips. Stir immediately and intermittently to make sure these strips wont get stick to each other. Deep fry until it becomes golden brown and crisp. When they become golden brown / crispy transfer it to a kitchen tissue to remove excess oil and sprinkle salt over it. Have you tried our other jackfruit recipes too? This entry was added on June 23rd, 2013 by Cini P Moideen in Bakery and tagged with nadan palaharam, snacks, evening snack, how to fry jackfruits, jackfruit recipe, kerala snacks, jackfruit snacks, jackfruit. Last revised on March 29th, 2018. Aww it looks yummy, surely i am gonna try this. Jackfruit chips are difficult to get it in north indian so recently I came to know about https://southindianstore.com/product/jackfruit-chips/ and i bought it from here. It was so yummy, just loved it.